Posture is the position assumed by the body either with support during muscular inactivity, or by means of the coordinated action of many muscles working (i.e. during muscular activity) to maintain stability or to form an essential basis which is being adapted constantly to the movement which is superimposed upon it. 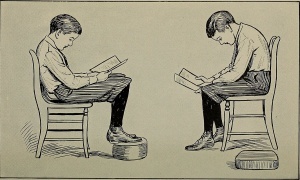 In an ideal erect posture, the body segments are aligned so that the torques and stresses are minimised and standing can be made with minimum energy expenditure. A forward head posture (FHP) or poking chin involves increased flexion of lower cervical vertebrae and the upper thoracic regions, increased extensions of upper cervical vertebrae and extension of the occiput on C1. The FHP is considered to co-exist with hyper-extension of the upper cervical spine, flattening of lower cervical spine, rounding of upper back, and elevation and protraction of shoulders. FHP may result in craniofascial pain, headache, neck ache and shoulder pain together with decreased range of cervical motion, muscle stiffness and tenderness. In FHP, the head shifts anteriorly from the line of gravity, the scapulae may rotate medially, a thoracic kyphosis may develop and overall vertebral height may be shortened. The features are as follows: there is an obliteration of the cervical lordosis and a compensatory tilting back of the head at the Atlanto-occipital joint. In the posterior cervical muscles there is stretching and weakness of Semispinalis cervicis and overaction with ultimate shortening of Semispinalis capitis. The corresponding flexor muscles in front, namely, Longus cervicis and Longus capitis shorten and lengthen respectively. Effect of gravity: slouching, poor ergonomic alignment. 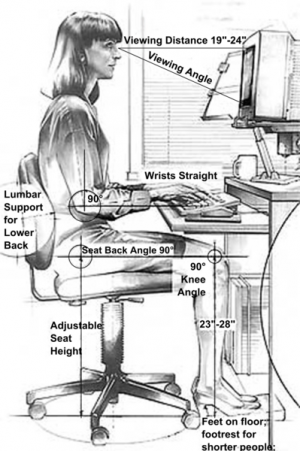 Occupational posture: forward or backward leaning of head for long durations, slouched or relaxed sitting, faulty sitting posture while using computer or screen. 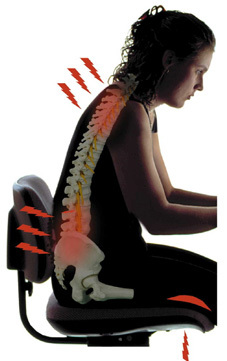 Result of other faulty posture like pelvic and lumber spine posture. Sleeping with head elevated too high. 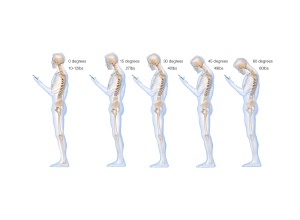 Texting posture maintained for long durations. Lack of development of back muscle strength. Source: Dr. Kenneth Hansraj Author: Dr. Kenneth Hansraj Permission: This work is free and may be used by anyone for any purpose. Anterior location of line of gravity (LOG) causes an increase in flexion (forward head), which requires constant isometric muscle contraction to support head which may result in ischaemia and pain. Stretch of suprahyoid muscles pull mandible posteriorly into retrusion which my result in temporomandibular joint pain and associated fascial tension. Narrowing of the intervertebral foramina in lordotic areas of cervical region, which may impinge on the blood vessels and nerve roots, especially if there are degenerative changes. Abnormal compression on the posterior zygapophyseal joints and posterior portions of the intervertebral discs. Stress to Anterior longitudinal ligament in upper cervical spine and Posterior longitudinal ligament in lower cervical spine. Mobility impairment in the muscles of the anterior thorax (intercostal muscles), muscles of the upper extremity originating on the thorax (Pectoralis major and minor, Latissimus dorsi, Serratus anterior), muscles of the cervical spine and head that attached to the scapula and upper thorax (Levator scapulae, Sternocleidomastoid, Scalene, upper Trapezius), and muscles of the suboccipital region (Rectus capitis posterior major and minor, Obliquus capitis inferior and superior). Impaired muscle performance due to stretched and weak lower cervical and upper thoracic erector spinae and scapular retractor muscles (Rhomboids, middle Trapezius), anterior throat muscles (suprahyoid and infrahyoid muscles), and capital flexors (Rectus capitis anterior and lateralis, superior oblique Longus colli, Longus capitis). With temporomandibular joint symptoms, the muscles of mastication may have increased tension (Pterygoid, Masseter, temporalis muscles). Observational postural analysis involves locating the body segments in relation to LOG (representative by plumb line). In an anterior or posterior analysis, the LOG should bisect the body into two symmetrical halves. In a lateral analysis, the LOG should passes anterior to the head, vertebral column, or joints of the lower extremities. Stretching Exercises of tight structures- Trapezius, Scalenes, SCM, Pectoralis Major and Minor. Cervical isometric strengthening exercises (initial phase) progressing to isotonic and dynamic strengtening exercises. Strengthening exercises for scapular retractors (Rhomboids, middle Trapezius). ↑ 1.0 1.1 Gardiner MD. The Principles of Exercise Therapy. Fourth Edition. Delhi: CBS Publishers & Distributors Pvt. Ltd., 2005. p245-55. ↑ 2.0 2.1 Kisner C, Colby LA. Therapeutic Exercises. Fifth Edition. USA: F.A. Davis Company.2007. p384-404. 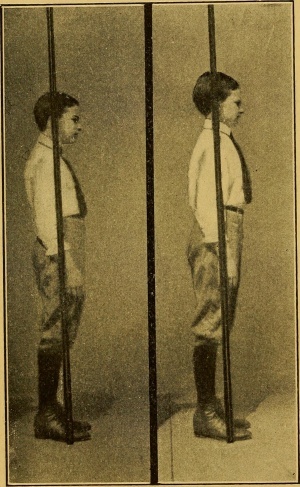 ↑ Raine S, Twomey L. Posture of the head, shoulders and thoracic spine in comfortable erect standing. Aust J Physiother. 1994; 40(1):25-32. Accessed 26 February 2019. ↑ Burt HA, Effects of faulty posture; President's Address. Proc R Soc Med. 1950; 43(3):187–194. Accessed 26 February 2019.